Have you ever wondered why your cup of coffee will vary in taste from one blend of coffee to another? Well coffee shares many similarities to wine in the way the flavour profiles are discussed and described, this is why often you may find that you just love a particular blend of coffee - serve it to a friend and they just don't find it that appealing. Just like anything in life the flavours and characteristics that you find nice about your favourite brew are subjective, something that will change depending on an individuals taste and preferences. So to look into this a little bit further it is important to know a little bit about your senses. There are two senses we use when establishing flavours and characteristics of coffee, that is the sense of taste and smell. The tongue supports taste and has four different receptors - they are sweet, salty, sour, bitter. However this is only half of the equation as your sense of smell tends to pick up much more complex characteristics. If you have ever heard of wine being described as 'smokey' or 'fruity with hints of berry' they are referring to what can be sensed via your sense of smell. Just like with wine - you will find the same aroma profiles with coffee. 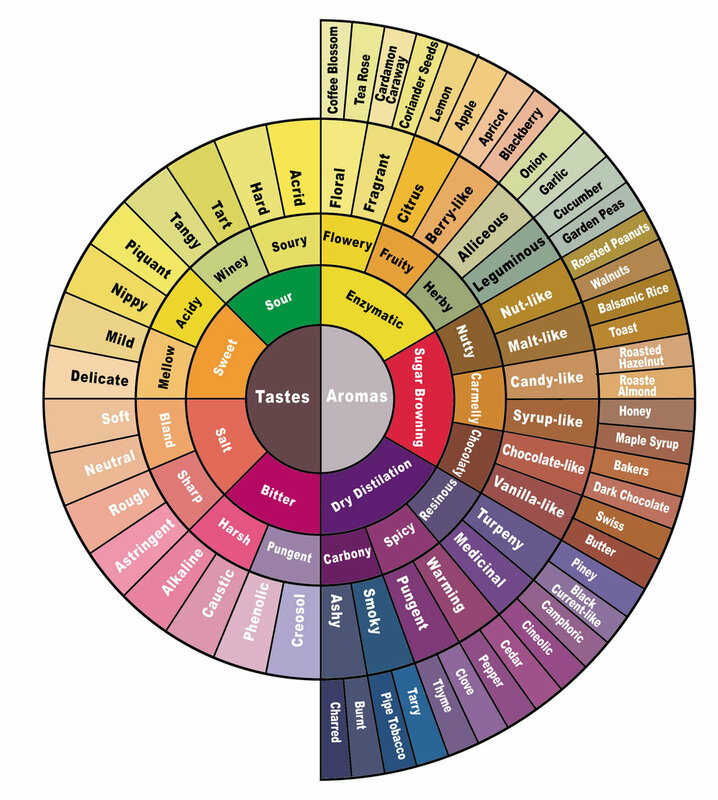 The diagram included is known as the Coffee Flavour Wheel originally created by the SCAA (http://www.scaa.org) this is a fantastic resource to use when sampling coffee to assist in understanding what tastes and aromas you are picking up. Coffees will exhibit different tastes and aromas depending on the location where they are grown - high or low altitude, wet or dry environment, heat etc. This is also dependant on how the beans have been roasted, you may find that the same blend if roasted a little darker may exhibit different attributes to a medium roast for example. It is also fun to experience the difference between single origin and blends of coffees. Coffee blends tend to be more well rounded, where as you may find single origins to be more 'astringent' or 'bright' as they don't have any other beans to balance them out. Professional roasters will use a technique called cupping when they are sampling different beans and deciding on how best to blend them. The technique of cupping shows off to the best degree the different aspects of a particular coffee, this process is always a bit of fun for a coffee enthusiast as you have the opportunity to appreciate the coffee for what it is-much like a wine taster would with wine. So what are you waiting for - take your coffee flavour wheel and get tasting!